Adobe Acrobat: The software uses Adobe Acrobat's free PDF reader for viewing and printing PDF files. If you do not have Adobe Reader installed, you’ll want to be sure to download and install Adobe Reader X (where X=current version), which can be downloaded for free from Adobe's Web Site. To learn how to set up Adobe as your Default PDF Viewer click here. Click the link below to learn how to update your browser to work with Adobe Acrobat. Launch Chrome and click on the 3 dotted menu option on the top right-hand corner of the browser. Click on Advanced then on the Content settings option. Search for 'PDF' or scroll down to find it. Click on PDF documents. Recommended: have the option to Download PDF files instead of automatically opening them in Chrome turned off. If you view them in Chrome, they will display with the Chrome System Viewer and not in Adobe. When you choose the print icon, in the Destination section (where your printer is likely selected), click the Change button. 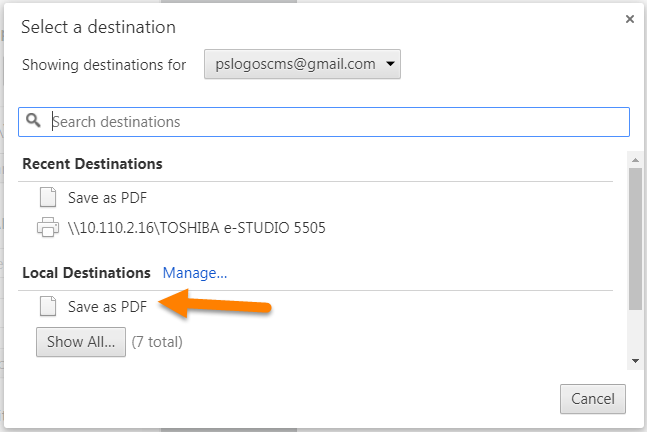 If you have the option to Save as PDF, you may choose this option. If you do not have this option, you must use one of the other browsers to save your report as a PDF. If you use Adobe Acrobat DC to display and print your checks, PDF reports, or Forms, you must mark the option to Print Actual Size to ensure proper alignment. You must have Adobe Reader installed on your computer to print Checks or PDF reports. Here is a link for Adobe Acrobat Reader DC. If Adobe PDF browser add-on is already enabled, you may have a different issue which may be addressed on the Adobe Acrobat Troubleshooting page for viewing PDF files on the web. The new Edge browser will not have any support for ActiveX plug-ins. Therefore, the Acrobat/Reader plug-in won't work with Edge. For more information, see Change in support for Acrobat and Reader plug-ins in modern web browsers. Use Internet Explorer 11 to open PDFs. 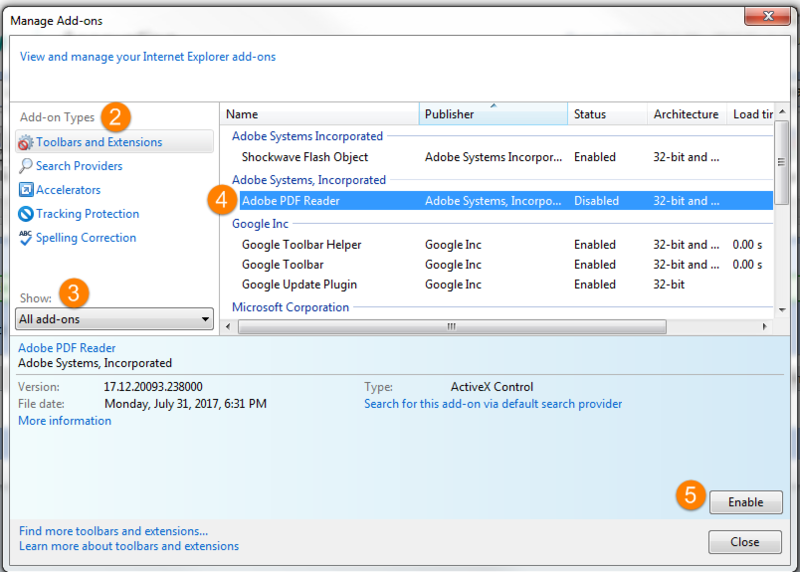 To enable the Acrobat/Reader plug-in in Internet Explorer, see the steps in the IE section. Once you have installed Adobe Acrobat Reader, it may be to your benefit to set Adobe as your default PDF reader. To set Adobe as your Default PDF reader, find a PDF document on your local drive and right-click. Select Open With, then select Choose default program. When the list of PDF Readers displays, select Adobe Reader. The following instructions walk you through how to Enable the Adobe PDF browser add-on (Internet Explorer 8 and later). If Adobe PDF browser add-on is already enabled and you are still unable to see your checks or PDF reports, you may have a different issue which may be addressed on the Adobe Acrobat Troubleshooting page for viewing PDF files on the web. In Internet Explorer, choose Tools > Manage Add-ons. Since browsers are frequently updated, if the above instructions are not pertinent to your version of Internet Explorer, click the following link to find updated instructions. How to enable the Adobe PDF Reader browser add-on. After Adobe Acrobat Reader DC is installed, set up Firefox to open PDF files in Adobe Reader. Click the three horizontal bars in the upper right corner of your Firefox browser. Click Options and the General screen will display. Scroll down to find Applications. In the Search window, type the word Portable. 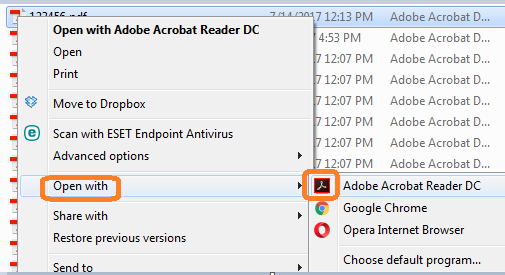 If anything except Use Adobe Acrobat Reader DC is in the Action Column, click the down-arrow to the right of Portable Document Format (PDF) and select Use Adobe Acrobat Reader DC as shown in the screen print below. The changes will automatically be saved.